Unique. Little can compare to O Carreirón Natural Park in the catalogue of protected areas in Galicia. Although its landscape is similar to that of some areas of the Illas Atlánticas National Park, it stands out for being a low area, with almost no elevation, and linked to the mainland by the bridge in Illa de Arousa, where it is located. A day of hiking and enjoying the beach is tempting in this peninsula with an intricate coast. Because that is one of the best characteristics of O Carreirón. The protected area can only be accessed through a single point: the roundabout at the entrance to the Illa de Arousa from the bridge connecting it to the municipality of Vilanova. The only road leads to two campsites and ends at a small roundabout and a paid parking lot. From there, the route can only be done on foot. And it’s worth it. Following the route marked with vertical wooden signs, hikers will first find the largest beach in the park, that of Xastelas. There one can find all the necessary amenities to spend a quiet family day at the beach: chiringuitos or beach bars, toilets and a promenade will delight those who want to enjoy the good weather and sunbathe. 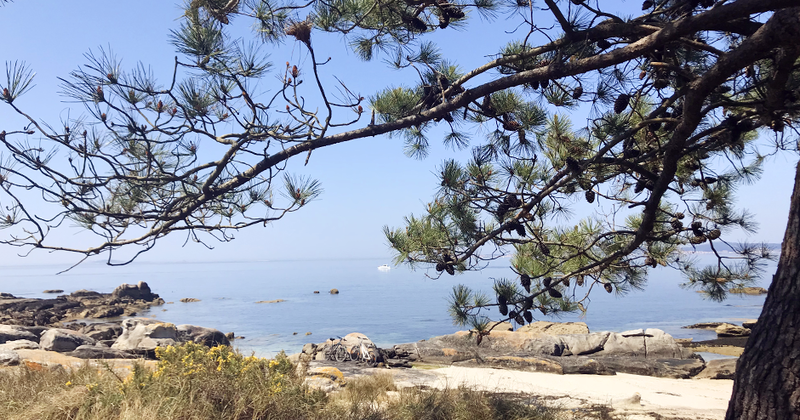 The water is especially calm in this area of ​​Galicia, since the beach is far into the Arousa estuary, facing Cambados. At low tide, this shallow area of the estuary allows bathers to walk dozens of meters into the sea before water covers them. The natural spectacle begins when turning at Xastelas. From this point and surrounding the entire peninsula that makes up O Carreirón are countless inlets, small beaches and rocky areas going in and out of the sea, giving visitors multiple bathing options. The beaches of Os Espiños, Dente de Can, Lontreira, Os Petóns … the best option is to stroll down the footpath and stop at whichever you prefer. Or at several, because the journey is short and easily done in an hour’s journey. It is advisable to keep an eye on the fauna, both at the foot of the sea (where, in the late afternoon, it is common to see a spectacle of fish jumping out of the water and birds, consequently, preparing for the hunt) and at the dunes inland (where it is easy to see good-sized lizards, rabbits and different types of birds). It is also very nice, especially when traveling with children, to observe the peculiar shapes of the surrounding rocks. Some have names that are very easy to understand at first sight, such as Con do Crocodilo (crocodile rock), Con do Fuciño do Porco (pig snout rock) or Tres Pés (three feet rock). In the interior is the O Carreirón lagoon, very shallow and just over a square kilometre in size. On it migratory birds nest and rest, and can be seen from watchtowers built for this precise purpose. It is a key point of the Birds’ Special Protection International Area and Arousa’s complex intertidal area.